Like the Uraguyan writer Eduardo Galeano who confessed that he just plain loved a beautiful game, no matter who was playing it, I am more a fan of the game than I am a fan of any particular team. I live so close to Arsenal's stadium that I can hear the games from my living room even when the windows are closed. I admire the young Gunners - not because they play the game perfectly (obviously, they don't), but because they look like they love to play. I am, though, in my heart of hearts more partial to the Spurs. They are even more spectacular in my eyes. When they go down, it's often dramatically - after having put 4 goals in the net. Sometimes they play not just with joy, but with near total abandon. Clearly, I love beautiful losers. Simon Barnes borrows this term from Leonard Cohen to wonder at how Arsenal fans are holding up. Tom Dunmore expanded on the theme for his site Pitch Invasion - and I thought I'd join this discussion of the affection some of us have for those who give us more than mere victory. I love beautiful losers both on and off the pitch. The pleasure, elegance, and virtuosity of a game are paramount. There is a righteousness to the well played game - a game that unfolds between the whole team in which the skill level is so high that the team's "stars" must establish their genius with death-defying headers, with outrageous runs, or a cross so fast and so precise as to be telepathic. But more than anything, 'beautiful losers' show you their love for the game above all else. It's one thing to talk about beautiful loser teams. This title also applies of course - and perhaps even more compellingly - to a few players. The most fabulous is probably Garrincha - Pele's countryman & misshapen teammate was never supposed to be able to run, but played perhaps the most gorgeous football in history. Garrincha never turned his genius into a "career" like Pele (who turned his name into a global brand). His last years (spent in alcoholic ignomy) were as hard as his first. That said, this end takes nothing away from the joy he gave to his fans. 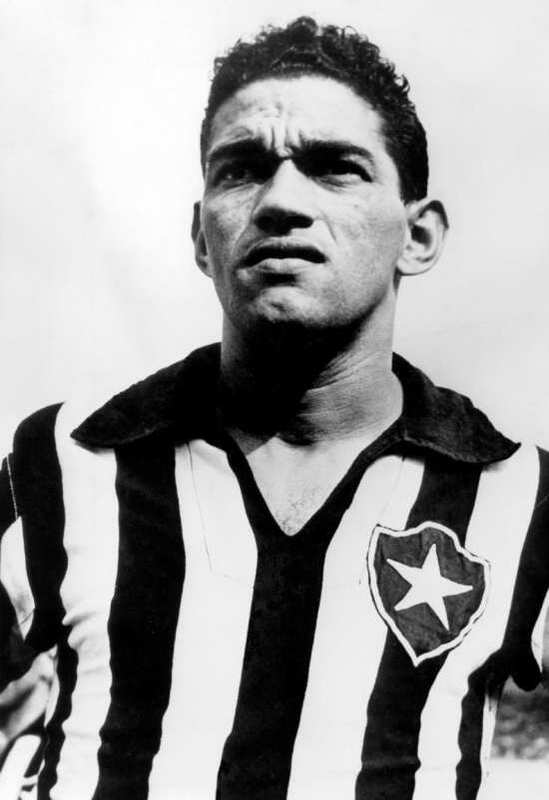 I don't know what it is, but footage of Garrincha can move me to tears - they are very sentimental tears, tears of joy - a strange kind of emotional sympathy for that improbable, impossible being who seems to fall out of the sky and onto the world stage - and whose unlikeliness seems to be the very engine of their genius. I'm more than a little tempted to link the particular nature of his legacy as a player to that of Edith Piaf - he has, I think, almost more in common with an artist like her than he does with other athletes. When Piaf (or Judy Garland or Billie Holiday) sang it was as if her entire being vibrated with some excess, some unnameable thing - it's beyond simple pleasure - and listening to them, you feel it in your bones, too. It's no accident that "Piaf" and "Garrincha" mean "little bird" and "wren". Garrincha's game was more of a song than a plan - and it seemed to lift everyone near it to another plane. But it also somehow felt like a game you could inhabit - and like the weirdest most unlikely part of yourself might be worth something. Take Piaf's performance of "L'Accordeoniste": This is an incredible song, which in and of itself goes to the point: The story is of "une fille de joie" (prostitute) and losing oneself in the nightlife - in music - it's a tragic story of a woman dreaming of something else, dreaming of her lover and another life - dreaming dreams that will never be realized (he goes off to war and never comes back). Nevertheless, inhabiting the music she loves totally, she transports herself to another place. The music in which she once lost herself to pleasure, however, becomes a special form of torture.... The key words here (rough translation): "It goes right through her skin, from the top to the bottom. She needs to sing, it's physical: her whole being is tense, she holds her breath - she's wrapped up in the music" - "la fille de joie" is the song, the song is her - being taken over by that music is too much, and there Piaf is, signing it, channeling it all for your pleasure. It's crazy. Sometimes that energy spreads out to a team - it radiates out from an individual body and becomes a collective consciousness. Loving a team like this is about loving the ride. It's not that we don't care about winning - we just don't want to give up extra thing - the beauty, the sublimity - in order to win. It's just not worth it.